Confront Harkon with Auriel's Bow. Vampire Side: After obtaining Auriel's Bow, Serana tells you that it is time to confront her father. Head back to Volkihar Keep. Once inside, it is not possible to initiate dialogue with any of the other vampires, who will instead direct you to Lord Harkon. He can be found upstairs in the Volkihar Cathedral, where he awaits you and Serana in his Vampire Lord form. When you confront Lord Harkon, he will begin by insulting you for your disloyalty towards him. When Serana tells him that she will not let herself be sacrificed and that you are on her side, Lord Harkon will give recognition to your persuasive abilities by saying that "This dragon has fangs". He makes a final insult to Valerica, and chides Serana for becoming more like her mother. At this point, Lord Harkon will demand that you give him Auriel's Bow. If you refuse to give it to him, he will attack you. Likewise, if you give him the bow, he will betray you and attack. Because both dialogue options end in him attacking you, it is not recommended to give him Auriel's Bow, as it can be very useful during the battle. Dawnguard Side: The Dawnguard side of this quest is much like the Vampire side, except that after acquiring the bow, Serana will tell you to head back to Isran. Once at Fort Dawnguard, talk to Isran, who will gather the rest of the Dawnguard. If you chose to become a vampire in order to gain access to the Soul Cairn, Isran will refuse to speak with you until you have been cured. After a short speech, everyone will head out to Castle Volkihar. Once you arrive there, the Dawnguard, including one armored troll, will start the attack on the castle, beginning with five vampires, a few Gargoyles and one Death hound who defend the outdoor approach to the castle. When they have been defeated, you will then lead the charge into Castle Volkihar, fighting the remaining vampires and Death hound. After all the vampires have been killed, follow Isran to a gated off doorway with a pull chain to the right of it. Pull it to raise the portcullis, then head up the steps and through the doors, where you will find Lord Harkon. The conversation with Lord Harkon on the Dawnguard side is somewhat different than the conversation on the Vampire side, mainly in the tone of the conversation and in Lord Harkon's dialogue with the player. Instead of insulting the player for their lack of loyalty, Lord Harkon will admit that it was only a matter of time before Serana would one day return with hatred in her heart. He then questions the player's allegiance to Serana by asking if she and Valerica are next after dealing with him. No matter what dialogue options you choose, Lord Harkon will eventually demand that you give him Auriel's Bow, where you are faced with the same choice. Note: It might be a good idea to time your assault against Castle Volkihar so that it occurs during the day and you can take advantage of Sunhallowed Arrows used on the sun to help take down the vampires who attack on the outside. Fighting Lord Harkon is the same regardless of whether you are a member of the vampires or the Dawnguard. If you are not prepared, Lord Harkon can be a difficult opponent to defeat. If you gave him Auriel's Bow, then you will be at a slight disadvantage. As soon as he exits dialogue with you, Lord Harkon will immediately summon skeletons and gargoyles to kill you, and will continue to do so throughout the fight. 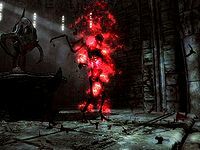 However, Serana is quite capable of handling them on her own, which leaves you to focus solely on Lord Harkon. Lord Harkon will continuously move throughout the room, firing Vampiric Drainballs at you and will frequently turn into a swarm of bats. As you deplete his health, Lord Harkon will turn into a swarm of bats and will materialize at the altar. As he hovers over the altar, he will create an impregnable shield of Blood Magic until he regains his health. If you have Auriel's Bow, equip it and fire at the shield, which will destroy it. Try not to waste Sunhallowed arrows during this fight, as Lord Harkon will do this repeatedly, and any arrow fired from Auriel's Bow will penetrate the shield. When his health is low, he will begin to frequently turn into mist; simply follow him until he re-materializes. Once the killing blow is struck, Lord Harkon will turn into a swarm of bats and materialize by the altar one final time, where he makes a final cry to his daughter's betrayal, and then melts into a pile of red ash. 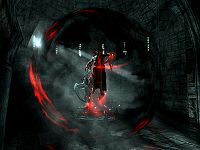 After the battle is over, Garan Marethi (if you are a vampire) or Isran (if you are a member of the Dawnguard) will enter the room, and will commend you for defeating Lord Harkon. He will then explain that there will be a new beginning for the Volkihar vampires or the Dawnguard, thus completing the Dawnguard questline. Serana will tell you that she will stay at Castle Volkihar or Fort Dawnguard, but will accompany you on your travels should you ask her. While you do not corrupt Auriel's Bow bringing it to its full potential, you can still use it to block out the sun once per day with Bloodcursed Elven Arrows. While the sun is blocked out, you will not suffer from any of the penalties of sun damage during the day. After one day, the sun will return and you will need to shoot it again. Bloodcursed arrows are necessary for this function. A dialogue option with Serana will open up that allows you to turn Elven arrows into Bloodcursed arrows. The blacksmith associated with your chosen faction will stock an additional 200 Elven arrows, which you can convert into Sunhallowed or Bloodcursed arrows. Certain Volkihar Clan or Dawnguard side quests will become available. If you sided with the vampires, Garan Marethi will ask you if you want him to restore the entrance to the courtyard the next time you talk to him. On the Dawnguard side, you can ask Serana to transform you into a Vampire Lord or convince her to give up her vampirism. On Lord Harkon's body you will find one of the sets of Vampire Royal Armor and Harkon's Sword, a unique katana. If you return to the Soul Cairn, Valerica will be amazed at Harkon's defeat and return to Castle Volkihar. Random encounters with members from the opposing faction in hold capitals and the wilderness will be less frequent. Random vampire attacks on settlements will only occur during an eclipse. You may sell the two Elder Scrolls to Dexion Evicus for 6000 gold after completing this quest, but only if allied with the Dawnguard. Since they will always remain quest items, this is the only way to remove them from the inventory. Killing Lord Harkon is necessary regardless of which faction you side with. During the battle, the music normally heard when battling dragons will play. The Dawnguard version of this quest may appear to freeze when Isran is summoning everybody: they will all stay there in a circle and apparently do nothing. This happens because one of the Dawnguard members has been relocated in some way (such as acting as stewardHF at a homestead), and they are traveling to their spot in the circle. Isran will not start his speech until they arrive; waiting for several hours will allow the missing Dawnguard member to arrive to the meeting more quickly, which will then proceed as intended. Isran's speech after killing Lord Harkon will mention that the Dawnguard will now dedicate itself to protecting Auriel's Bow, but he never asks for it, and there is no way to give it to him. There is a subtle hint in Isran's dialogue suggesting a small amount of character development over the course of the questline. When Serana first arrives in Fort Dawnguard, Isran refers to her as an "it," rather than a person, and refuses to even refer to her by her name. In this quest, when Isran questions whether Serana will be able to commit patricide for the greater good, not only does he refer to her by her actual name, but he even uses the pronouns "she" and "her," suggesting that he has grown to respect Serana for her personal sacrifices made for their cause. When Lord Harkon's health is reduced to zero, he may become invincible, forcing you to reload a previous save from before entering Volkihar Cathedral to begin the fight again. Save the game and move your character, then reload the game. When it has been reloaded, Harkon's death scene will play. If that doesn't work, try disabling and re-enabling the Actor through the CC. Make sure you've already saved the game prior to that. It usually results in one ultimate death blow needed to finally bring him down and initiate the death sequence. Sometimes Lord Harkon will not take any damage from any attacks. Reloading a previous save will fix this. Saving before entering the final room of Castle Volkihar is recommended. If in stealth mode and unseen by Harkon during his dialogue with Serana, instead of speaking to you he will simply pause. Since you cannot leave the cathedral, the game will essentially be frozen. You have to either be seen by Harkon, which will trigger him to commence his dialogue with your character, or you can attack him. If you attack, you won't get the dialogue options, but the battle will play out normally. It is best to avoid using dragon shouts during the final battle. All sorts of bugs and collisions can occur, and on the PC, it may freeze or crash to desktop. When transitioning into bat form, hitting Harkon with Unrelenting Force may blast him into the scenery. ? If his script is already buggy and you work at it long enough, it is possible to summon Durnehviir into Volkihar Cathedral during the final battle. The game will immediately crash. ? Serana may stay locked in combat after Harkon dies, making it so dialogue is unavailable. Attack Serana until she goes down (or exit the room and initiate conversation), and she will speak. If you exit the room and initiate conversation with Serana, her dialogue will be normal, but the other NPC may leave and you will lose the chance to speak to Isran or Garan. After entering Volkihar Cathedral to confront Lord Harkon, the Vampire Lord and the Revert Form powers no longer function. ? To fix this issue, open up the console, select your character (by clicking on it or typing prid 14) and type resurrect. Sometimes after you've used Auriel's Bow, it can cause your weapons to malfunction, resulting in you not being able to use them. This prevents you from being able to attack with either weapons or magic. Reloading the latest saved game or transforming into a werewolf will fix this. ? This quest will not start on the vampire side if either of the two hireable Deathhounds have been killed and their bodies have been removed from the game. You can start the quest manually using setstage DLC1VQ08 10. The bodies of the Volkihar vampires are never cleaned up once this quest is completed on the Dawnguard side. After defeating Harkon, you may be unable to interact with Isran. You may interact normally with him back in Fort Dawnguard. The chest found after defeating Harkon may remain empty. 20 With Auriel's Bow in my possession, I need to rally the forces of the Dawnguard before I attempt to confront Harkon and put a stop to the prophecy. With Auriel's Bow in my possession, it's time to confront Harkon and reshape the prophecy as I see fit. The following empty quest stages were omitted from the table: 0, 25, 30, 50, 55. On the PC, it is possible to use the console to advance through the quest by entering setstage DLC1VQ08 stage, where stage is the number of the stage you wish to complete. It is not possible to un-complete (i.e. go back) quest stages, but it is possible to clear all stages of the quest using resetquest DLC1VQ08. This page was last modified on 24 February 2019, at 09:17.